Near-full sensory perception for amputees isn't the distant dream it once was. While the past few years have been exciting in terms of technology generally, they have been especially exciting in the field of prosthetics. The designs behind prosthetic arms and hands live in a state of perpetual inmprovement, offering their users more and more functionality every year. Now, however, a team based in Lausanne, Switzerland has unveiled something really game-changing: the first prosthetic in the world to offer its wearer a true sense of touch. Developed by Dr. Silvestro Micera of the Ecole Polytechnique Federale de Lausanne and his team, the prosthetic is designed to be attached to the two main nerves in its owner's arm. By hooking the limb and its advanced wiring directly into the nervous system in this way, Micera believes that the wearer will be able to experience real sensations of touch and grasp at the same time as controlling it using just the power of their mind. "This is real progress, real hope for amputees. It will be the first prosthetic that will provide real-time sensory feedback for grasping," said Dr Micera at the annual American Association for the Advancement of Science (AAAS) meeting this week. "It is clear that the more sensory feeling an amputee has, the more likely you will get full acceptance of that limb," he continued. While a few notable prosthetics have allowed those wearing them to move them with their minds and experience basic sensations, Micera's prosthetic goes a step beyond. "The idea would be that it could deliver two or more sensations. 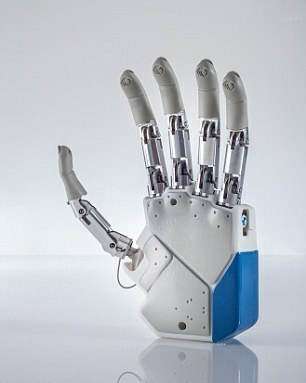 You could have a pinch and receive information from three fingers, or feel movement in the hand and wrist," Micera said. Micera continued, "We have refined the interface [connecting the hand to the patient], so we hope to see much more detailed movement and control of the hand." The device in question will soon be given to an unnamed Italian man in his 20's who lost one hand and part of an arm in an accident. A few questions still remain regarding how comfortable users will find such an attachment, and whether or not having wires going directly into their skin, rather than beneath it, will prove too problematic. If the experience of Italian X proves to be a positive one, however, Micera hopes to have a fully kitted-out version with subdermal wiring ready for much wider distribution within 2 years. Good feelings, hey? Good feelings all round.